At least 31 have been killed and more than 90 injured in a terrorist attack in Urumqi, the provincial capital of Xinjiang province in China. The attack is the latest in a string of attacks believed to have been perpetrated by Uighur separatists, a mainly Muslim group many of whom seek independence. The attackers reportedly crashed two cars into shoppers at a market in the centre of the city and threw explosives from their vehicles. 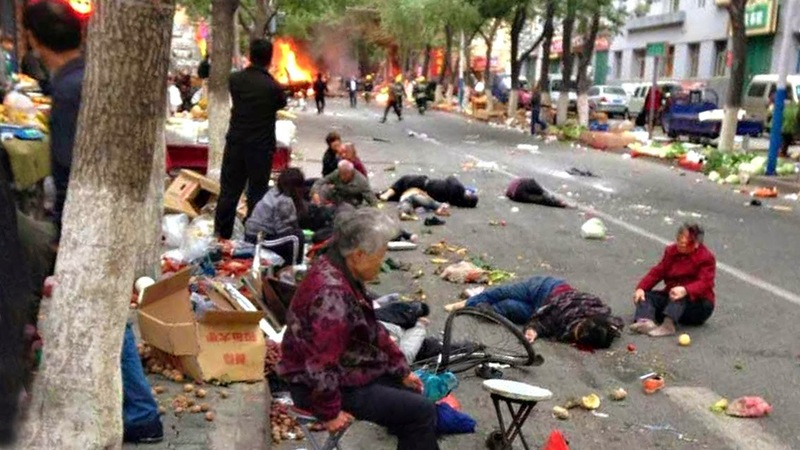 Photographs posted to Chinese social networks showed bodies strewn in the streets and flames leaping into the sky from the area near to the incident. The Ministry of Public Security called it a "violent terrorist incident", though information about incidents in the region, where ethnic tensions between Uighurs and Han Chinese continue, is tightly controlled. The news was largely downplayed in Chinese media and eyewitness accounts and pictures posted on Sina Weibo, China's version of Twitter, were deleted by censors. Reports were also scant on Western media too. Whilst Sky News, the BBC and CNN all carried reports, most were brief. Foreign reporters are mostly banned from the region making it difficult to gather information about incidents except through official sources and social media. According to Xinhua the attackers struck at 07:50 local time, Thursday, at an open air market at Park North Street near Renmin Park. In response to the attack, Chinese President Xi Jinping pledged to severely punish terrorists and spare no efforts in maintaining stability, the news agency said. However as reported earlier this month, China will have a difficult time in stemming what appears to be a growing terrorist insurgency. Whilst security controls are tight, in what is essentially a police state, the country is vast, making it easy for terrorists to hide amongst the general population. Speaking on Al Jazeera, Roderic Wye, an Associate Fellow with the Asia Programme at Chatham House, said the attacks were likely to have been perpetrated by Uighur separatists but that there was likely to be some outside influences from the wider radical Muslim population beyond China's borders. Xinjiang, which is home to the Muslim Uighur minority, has seen a spate of attacks in the past year. In October a four wheel drive vehicle was driven into a crowd in Tiananmen Square before exploding in flames injuring 38 and killing 5 including three attackers [Wikipedia]. In March this year 29 people died and some 143 were injured after four people attacked civilians at Kunming railway station in Yunnan province [Wikipedia]. And in April this year at least three died and 79 were wounded after a knife attack and suicide bomb blast at Urumqi station which coincided with a visit by Chinese president Xi Jinping to the city.